My BC is a Zeagle Ranger with an Octo+ octopus and an additional vest pad installed. It is supremely comfortable, and with its integrated weight system, I don't have to wear a separate weight belt (I hate weight belts). 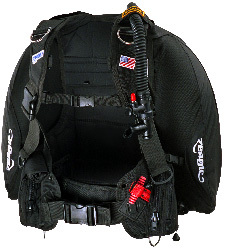 It has a unique rip-cord weight release system that is derived from Zeagle's experience manufacturing sky-diving packs. My regulator is a U.S. Divers Micra Adjustable. I chose it more for its small size than for its adjustable properties. Just the same, the ability to fine tune the breathing resistance is very nice. For my instrument console I chose a U.S. Divers Pivot Matrix Master dive computer. It is essentially a standard console boot with an analog SPG, compass, and digital dive computer. Friendly Tip: Don't forget to activate your dive computer before you descend! I thought I had activated it on one of my dives but I hadn't, and the Matrix Master won't activate while you are at depth. I had to use my dive buddy's (analog) depth guage for the whole dive! My fins are Mares Plana Avanti Quattro fins. My mask is a SeaQuest Ventura. My snorkel is a SeaQuest SideDraft Flex. Mine is black though, not green. Installed between the low-pressure inflator hose and the Octo+ octopus is a Dive Alert DA-2 air horn. It is very loud and very effective at getting the boat's attention if you need assistance. Not pictured are my Deep See diving knife, boots, and gloves, and a host of other widgets.